"Control stick" redirects here. For the actions the Control Stick does in the games, see Controls. The Glee Spinner (たましいの石?, lit. : "Stone of Soul") is a treasure in Pikmin 2. It is actually a GameCube Control Stick. It is found in the third sublevel of the Dream Den, inside the body of a Spotty Bulbear. 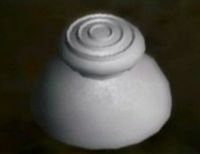 The player should defeat any Dwarf Bulbears and Careening Dirigibugs that may be in the way when transporting it to the Research Pod. An easy way to obtain it is to simply make the Spotty Bulbear fall down a hole in the level, which can be easily done by moving the leader so that the gap is between him and the Bulbear. Once the Bulbear falls through, the Glee Spinner will materialize nearby. The Glee Spinner being analyzed. German Freudenkreisel Written "Freuden-kreisel" in-game. This page was last edited on December 12, 2018, at 09:30.